My Father's Shoes - Our Coffin Story, Pages 1 to 25. Tristram Coffyn was born in 1609 in Brixton Parish, town of Plymouth, Devonshire, England and baptized March 11, 1610. He was the eldest child of Peter and Johanna Coffin. Coffyn's early years in England were during a very eventful time. Intellectual freedom was being claimed as a right for each individual. This period was during the reign of James I. Among the names of the day were William Shakespeare, Francis Bacon and Oliver Cromwell. It was a period when the Puritans were making large gains in the Parliament. Tristram had one younger brother, John and four sisters, Johanna, Deborah, Eunice and Mary. When Tristram was 19 his father Peter, died. His will was dated December 21, 1627 and was proved by his widow Johanna on March 13, 1628. In the will it was declared that Tristram was to be provided for according to his degree and calling. Tristram was a farmer and therefore most likely took control of his fathers estate near Plymouth. Two years later Tristram courted and wed Dionis Stevens, daughter of Robert Stevens of Brixton. Dionis Stevens was born in 1609 although other accounts say 1613. Shortly after their marriage, their first child Peter was born in 1631 followed by their son Tristram Jr., born in 1632. During the early 1630's England entered into a storm of conflict with the death of James I and the succession of Charles I. In 1638 the Scots took up arms against the King. The Presbyterians took control of the Commons and this was followed by an all out civil war in 1642. During this period of time Tristram and Dionis had two more children Elizabeth (d.o.b. unknown) and James born August 12, 1639. Dionis was also pregnant with their fifth child. In 1640 Coffyn was selected as a Warden of Brixton Parish. Shortly after in November 1640, he leased his farm that was located at Butlass. With the civil war closing in on his family and the wounding and eventual death eight days later of his brother John at Plymouth Fort, Tristram decided to take his family, including his mother and two unwed sisters to safety in Colonial America. Tristram's friend Robert Clement was leaving for America shortly, aboard a small fleet of ships, some of which were owned by Clement. Tristram quickly put his affairs in order and embarked on his journey with his family aboard Clement's ship named "Hector Clement" in the spring of 1642. This proved to be the last time Coffyn was to see his home in England. secured living quarters for his family and started exploring up the Merrimack River with Robert Clement in search of a good location for a more permanent home. He arrived in a soon to be called settlement named Pentucket, now known as Haverhill Ma. The book "The History of Haverhill" by George Chase states that Clements son, Job Clements had already settled in the area a year earlier, if so, this could be the reason that Coffyn and Clements chose this area. They found the area to have fertile soil with the necessary resources to build a farm, however, it was recorded that the large population of wolves were a problem with the flocks of sheep and a guard had to be posted at all times. In 1641 there were only six homes built in Pentucket. Tristram's group of settlers negotiated with the Indians for the property rights and secured a large area for the sum of three pounds ten shillings. A copy of this deed is still on record and bares witness to the signatures of Robert Clement and Tristram Coffyn, dated November 15, 1642. Not only is this the first record of the first Coffin immigrant in America, but it also indicates how Tristram spelled his surname, Coffyn, with a "y" instead of an "i". It was also during this period that John, their youngest child fell ill and died. Dionis was also pregnant with their sixth child who was later named Deborah. She was born the first Coffin child in America, and the third child born in the tiny settlement but was destined for the same fate as the other newborns and died three weeks later. These deaths give evidence to the harsh conditions that the first immigrants must have encountered upon their arrival in the new world. The living conditions were primitive and unforgiving and many families suffered greatly. It was noted that Coffyn was the first white settler to plough land in the area, having made his own plough from materials at hand. A few years after his arrival in Pentucket, his daughter Mary was born, becoming the first Coffin child to be born and survive to adulthood in America. Shortly after Coffyn's arrival, the settlement was threatened when Indian war parties decided to target the settlers homes. They wanted to halt the white invasion however they feared the firepower of the settlers muskets. The Indian plan was to send a small group to each of the settlers homes at the same time and gain entrance to the houses by way of presenting goods for trade. Upon a predetermined signal, the Indians would jump the white men, cut their throats and ransack the house looking for weapons. What the Indians didn't know was that one of their members was a Colonial informant who revealed the plan to British intelligence and the British soldiers, along with about forty settlers disarmed the Indians before they could set the plan in motion. After only a few years of farming in Pentucket, Tristram embarked on a new direction. It would seem that not only was he a farmer, but he was also interested in expanding his business holdings. When the opportunity arose to operate a ferry back in Newbury, Tristram decided to move his family once again. The History of Newbury states that in 1644 Tristram Coffin Sr. is allowed to keep an Ordinary (Tavern) which consisted of selling wine and keeping a ferry and Inn on the Newbury side of the Merrimack River. George Carr kept a ferry on the Salisbury side across from Carr Island. Tristram's ferry crossed from Newbury on the south side of the river, between Carr Island and Ram Island, over to the north side to the town of Salisbury. The ferry was most likely a tow ferry with oxen providing the power to pull the craft across the river, with his sons helping to load and disembark the passengers. In the 1650's Tristram's eldest children began to expand their horizons with Peter leaving Newbury to go to Dover, New Hampshire, where he became involved in the lumber business along with holding a variety of public office positions. Tristram's daughter Elizabeth wed Stephen Greenleaf in 1651 and resided in Newbury where the couple eventually had ten children before Elizabeth's early death. Tristram Jr. married Judith Somerby in 1653 and became a weaver/tailor and Deacon of the First Parish of Newbury. Tristram Jr. is also the person who brought the Coffin name to the old Coffin house in 1654, which still stands in Newbury, after housing over 240 years of Coffin descendants. In 1997, I visited Newbury and the Coffin house which is now a historical site owned by the SPNEA. 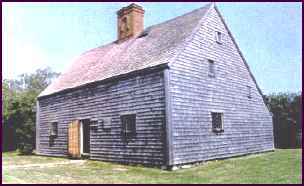 The Coffin house is one of the earliest homes constructed of wood still standing in New England. It is believed that the father, Tristram Sr., lived here shortly before moving to his new home in Nantucket. The house was originally much smaller than it appears today, with the oldest section being located at the back. In 1735 the first centennial of Newbury was celebrated by the town in the front yard of the Coffin house, under two gigantic elm trees. Inside, one is struck by the large fireplace located in the middle of the house, in a room referred to as the "hall". This is where the cooking, dining and visiting took place. Above this area was the hall chamber, or sleeping chamber. 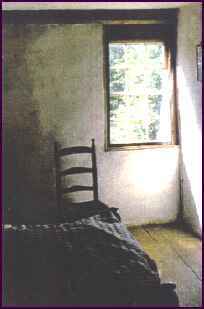 When I visited the sleeping chamber, a large cradle lay on one side of the room. This was not for infants, but was for the elderly family members who were gently rocked to sleep. On some of the beams near the stairs were engravings carved in the beam, these were thought to ward off evil spirits. Much of the family time in the house was spent reading the bible as this was an era of strong religious beliefs along with the threat of evil coming in the form of witches and devils. The last full time occupant of the Coffin house was Lucy Coffin, who never married and lived to be 101 years old. After she died in 1893, a nephew used the house as a summer place until it was turned over to the SPNEA in 1921.
eventually led the Coffyns into confrontation with the law. The laws of 1645 stated clearly that "every person licensed to keep an Ordinary (Tavern) shall always be provided with good wholesome beer of four bushels of malt to the hogshead, which he shall not sell above two pence the ale quart, on penalty of forty shillings the first offence and for the second offence shall lose his licence". Dionis' ale was made with six bushels, giving it a kick that kept them coming back for more. For her troubles she increased the price by one pence and in turn had to stand before the court to defend her actions. Eventually the charge was dismissed, but word spread quickly through Newbury as to where to go for a quality ale. According to the book "Ould Newbury" by John Currier, the Coffyns owned forty acres across from Carr Island. In later years the road to the Inn was known as Coffin Lane and was on the west side of present day Jefferson St. down by the Merrimack River. Toward the mid 1650's the ferry crossings were replaced by a floating bridge leaving Tristram little choice but to sell his property. He moved across the river to Salisbury where records show his name on some documents as Commissioner of Salisbury. It was during these years in the late 1650's that the first plans to relocate his family to a more desirable location were first laid out. Depending on which source one would believe, there are many arguments that have been brought forward as to why Tristram decided to leave Massachusetts. All would have been valid arguments. It was true that the Puritan rule was harsh and prejudice against freedom of choice both religiously and politically. It was also true that the desire to move to an area where fences were not needed for the livestock (that an Island would provide) would be of some benefit, mainly monetary. In the end, Tristram's will to keep his family together around him in a community outside of the smothering rules of the Puritans, and guarded by miles of ocean, could have been the driving factor behind his decision to locate to a new home. In talking to his friends and neighbours he found he was not alone in his thinking. Others were also anxious to leave, many for the same reasons as Coffyn. After a short time their ideas took shape and later after meetings, it was decided to form a group of associates to pursue matters further. The idea of common pastures and buildings were appealing to many, especially the farmers who were advancing in age. The back breaking life of maintaining a farm could now be shared among the group with common mills and labour supplied by the Indians. How the Island of Nantucket, thirty miles off the south shore of Cape Cod ever came forth as a choice, is once again debatable. Some point out that the connection lies with Thomas Mayhew, the owner of Nantucket and Martha's Vineyard, was a cousin of one of the associates in Tristram's group, a man named Thomas Macy. Others think that Nantucket simply came up in a passing conversation and caught the groups imagination. At one meeting the decision was made to send Tristram Coffyn, possibly his son James, Edward Starbuck and cabin boy Isaac Coleman on a fact finding mission to meet with Mayhew and view Nantucket to assess its suitability as a home. Early in 1659 the men set out for Edgartown in Martha's Vineyard, the home of Thomas Mayhew. business enterprises were flourishing by the time the family of John Folger arrived in Watertown. Mayhew had a son named Thomas Jr. who was very religious. Folger's son Peter was close to the same age as Thomas Jr. and the two became friends. They both shared an appetite for adventure, so when the opportunity came forth for the Mayhew's to purchase an Island named Nantucket, from the Earl of Stirling in 1641 for forty pounds, the adventure began. After seeing the Island it was concluded that Nantucket Island was too far off shore and that Martha's Vineyard would be a more suitable island to inhabit, so shortly after Mayhew also bought Martha's Vineyard. Thomas Mayhew Jr. moved quickly to establish his home on Martha's Vineyard bringing Peter Folger along with him. His mission was to teach the Indians that inhabited the Islands' Christianity. Folger was to be a school master and surveyor. The work was quite successful and the elder Mayhew came to join them in Edgartown. In 1657 Thomas Jr. found it necessary to go to England to stimulate more financial support, however, his ship was lost in a gale on the crossing and he was never heard from again. Mayhew was devastated by the loss of his son, however he decided to continue with his son's mission. Folger on the other hand was looking for a change. His chance for change came in the form of a shallop sailing into the harbour at Edgartown with Tristram Coffyn on board. It's interesting to note that this simple twist of fate with Coffyn arriving in Edgartown while Folger was searching for a new adventure, brought about one of the circumstances to which American statesman, scientist and writer, Benjamin Franklin would later be born into. Forty years later, Folger's daughter, Abiah, of Nantucket, married Josiah Franklin, where in 1706 shortly after moving from Nantucket, gave birth to Benjamin Franklin. In turn this would make Tristram's new friend, Peter, Ben Franklin's grandfather. Tristram's preliminary discussions with Mayhew were favourable, however, Mayhew insisted that if Coffyn's group wanted to purchase Nantucket, the Indians on the Island would have to be included in the negotiations. It was estimated that Nantucket had about 700 Narragansett Indians living in six villages, mostly on the east shore. Today, there is not a single Indian descendant living on the Island. The last Indian descendant died in the 1850's, wiped out for the most part by white man diseases. Nantucket in Algonquin is interpreted as "far away Island". Coffyn realized that without an interpreter he would have problems communicating with the Indians. To address this problem he enlisted the services of Peter Folger who was also a skilled Surveyor. Shortly thereafter, the group left for the Island. The Indians greeted them favourably and although their interpretation of purchasing land proved to be different than the white interpretation, they agreed on the idea. In later years the Indians were surprised to learn the meaning of " trespassing", for in their culture no one ever owns property but instead they only had rights to live upon it, yet anyone could travel through it. The whites wouldn't allow this for fear of livestock disappearing. Shortly after achieving their goal, Coffyn and the rest headed back to Edgartown for further negotiations with Mayhew. Committed to carrying on with his lost son's mission, Mayhew had no real interest in Nantucket and therefore agreed to very reasonable terms for the purchase of the Island. The sale price of 30 pounds along with two beaver hats, one for him and one for his wife, was a bargain especially if one considers that after owning the Island for close to twenty years Mayhew was selling it for ten pounds less than he bought it for. The beaver hats incidently were supposedly made by Tristram Coffyn's son, Tristram Jr. Today one can only speculate on the mood of the negotiations, but judging by the eventual results, Coffyn and Mayhew must have respected each other a great deal in order for things to have gone so smoothly. Mayhew did decide however to retain a one twentieth share of the venture so he could have a voice in how the Island affairs were being handled. Coffin returned home to Salisbury to organize the purchase of Nantucket. Once there, his eight partners ratified the agreement with Mayhew and ten new partners and ten tenant inhabitants were admitted into the company. The half share partners were tradesmen who were needed to help develop the settlement. Folger was the interpreter/surveyor who later became the miller. Joseph Gardner was a shoemaker and Nathaniel Holland was a tailor etc. Some of the other half-share holders listed didn't join the group until the later years. In the fall of 1659 before any formal deed was drawn up with the Indian leaders Wanackmamack and Nickanoose, James Coffin, Thomas Macy and family, Edward Starbuck and Isaac Coleman left Salisbury for Nantucket to take up residence. Macy was in trouble with the Puritan judges for harbouring Quakers during a short rain storm. Nantucket was out of the Judge's legal realm, so rather than stay and face the charges he decided that the sooner he could leave Salisbury the better it would be. Edward Starbuck was Macy's partner in the company and also his best friend. He felt compelled to go with Macy and the rest to see them through what was going to be a tough first winter. James Coffin age 19 went to watch over his father's interests and Isaac Coleman age 13 was probably just looking for adventure. The first winter on Nantucket proved to be one full of hardships. The crossing was reported to have been a rough one in which the tiny craft was almost lost. During the first winter the Indians were said to have been most helpful in seeing to the needs of the first white settlers on the Island. In the spring of 1660 Edward Starbuck returned to Salisbury to update the rest on the progress of Nantucket. The reports were favourable and others made preparations to relocate quickly. spiritual leader, having embraced Quakerism. Mary and Nathaniel also had the honour of having the first white baby on the Island during the early 1660's. Also to the south lay the lot of James Coffin. After Tristram, James was the head of the Coffin interests on Nantucket. The first years of settlement consisted of building houses along with shelters for their livestock, mainly sheep and oxen, as well as developing pastures and common buildings. The Indians helped to develop the farms and taught the settlers a great deal about living on the Island. In turn they were given employment and some formal education. The first years were often regarded as the best years upon Nantucket, in terms of creating a society that flowed in harmony, where one could rely on their neighbours as though they were family. The great grandson of Thomas Macy would later write, "The little community was kind and courteous to each other and hospitable to strangers. The prevalence of good feeling was remarked and felt by all who came among them". From the beginning Tristram Coffyn and Thomas Macy were the spokesmen for the settlement. In 1671 they were selected by the group to go to New York and meet with Governor Lovelace and secure their claim to the Island. Upon their return the Islanders nominated Coffyn to be Chief Magistrate of Nantucket. The town also selected all other officers except the Chief Military Officer who was to be selected by Governor Lovelace from nominees chosen by the settlement. After a few more years of harmony, or about the early 1670's the first signs of trouble on the Island began to appear. The problems came through the evolution of the two classes of settlers. On one hand they had the full share owners and their partners, who by Nantucket law had two votes each. On the other hand the half share owners only had one vote resulting in less of a say on Island affairs. They viewed themselves just as important as the full share settlers. The only thing missing for a revolt by the half share members was a leader. That changed in 1673 when it was decided that the community needed to expand their fishing interests by enlisting the services of a skilled tradesman by the name of John Gardner of Salem, Massachusetts. Gardner was the brother of full share owner Joseph Gardner. Right from the start John Gardner challenged the original owners on most issues and from this began the feud between the Gardners group and the Coffin group. to get himself appointed as Chief Military Officer. This all came about shortly before the Dutch takeover of New York. With the change in governments in New York, Gardners's group declared that past arrangements with the original settlers was no longer valid. The tension ran high for a short period until the Dutch were run out of New York and the old government was reinstated. Upon this action, Tristram and Mathew Mayhew, grandson of Thomas, once again sailed for New York and had their agreements with the government reinstated. In 1676 Thomas Mayhew became Chief Magistrate on Nantucket with Peter Coffin, a new resident on the Island becoming Assistant Magistrate. Peter and James Coffin had returned to the Island as a result of the conflict on the mainland between the Indians and the white settlers known as King Philip's War. This appointment of Macy and the election of Peter Coffin infuriated the Gardner group. Not only was Peter a "Coffin" he also held government positions back in Dover and was not considered a full time resident of Nantucket. A few years later the tension eased with the elections of James Coffin, John Gardner and Nathaniel Starbuck who would all be elected as Assistant Magistrates. The feud continued toward the late 1670's in a period that would result in Tristram Coffyn being selected as Chief Magistrate by Governor Andros in the hopes of trying to pull the community back together. Coffyn was regarded by most of the settlers as the one person who could rectify Nantucket's struggle with growth. Unfortunately, for everyone, a shipwreck on the Nantucket shoals diverted any plans that Tristram had for the Islanders. In September 1678 a French ship ran aground during a storm, forcing the crew to abandon ship. Shortly thereafter the cargo was salvaged by certain parties and sold for profit. This action put Tristram, who was chief magistrate, in violation with maritime law which stated that the cargo should have been secured until claimed by the owner. In failing to do so, Tristram subjected himself to be responsible for the lost cargo. The courts came down hard on him with a stiff penalty which would ruin him financially. The action cast a dark cloud over Coffyn, who was now in his early 70's. His family rallied to his side but the strain of the penalty along with the feuding years had worn him down. His son James made financial arrangements to pay the fine. In the end, surprisingly, it was John Gardner, who had become the new Chief Magistrate of Nantucket, who stood up to the courts with a touching appeal on Coffyn's behalf. He convinced the courts to reduce the penalty substantially. When all was said and done what remained was Coffyn's ill health. The year was 1681, and autumn was closing in. Coffyn had made the arrangements that were to follow his death back in 1678. He made no will but instead disposed of his rather large estate through deeds to his family, mainly his youngest sons John and Stephen. To his numerous grandchildren, 60 in all, he granted 10 acres of land to each one upon the Coffyn's Island of Tuckernuck, off the west coast of Nantucket. In 1681 Tristram owned two houses on his property, the first dwelling house he deeded to Stephen and the new house upon the hill was to go to John. His son Stephen was asked to care for their mother, Dionis up until her death. On October 3, 1681 Tristram Coffyn died, he was 72 years old at the time of his death. His funeral brought out all the Islanders including the Gardners to mourn his passing. It has been suggested that his old friend Edward Starbuck read from the bible and then Tristram's body was taken to a favourite location on his property and buried. Through the years the exact site of his grave has wandered from memory, however, the man himself lives on in each one of his descendants. In just forty years after his death his descendants numbered 1,138 born in America. In 1728 the number had increased to 1,582. All of them descendants from one couple, Tristram and Dionis Coffyn. Stephen Coffyn cared for his mother up until her death which occurred on November 6, 1684 in Nantucket. Honorable Peter Coffin was born in England in 1631. He was the first child of Tristram and Dionis. Peter married Abigail Starbuck, daughter of Edward Starbuck. He resided in Dover, New Hampshire for a good portion of his life before moving his family to Nantucket. He later moved his family to Exeter, New Hampshire, where he became Chief Justice of the Supreme Court of New Hampshire and a member of the Governor's Council. The Coffin's had ten children including their son Jethro whose house is considered the oldest house still standing on Nantucket having been built in 1686. Tristram Coffin Jr. was born in England in 1632. He married Judith Somerby of Newbury, Massachusetts, in 1652. Tristram was a weaver and filled many notable positions on the Newbury Town Council. He was named Deacon to the first Parish of Newbury. His house in Newbury is known as the Old Coffin House. Tristram Jr. and his wife Judith's graves are marked in the cemetery of the First Parish of Newbury which is located across the street from the Coffin house. Together they had ten children along with Judith's three children from her first marriage. Elizabeth Coffin was born in England in 1634. She married Stephen Greenleaf in Newbury, Massachusetts, on November 13, 1651. From this family the Greenleaf's of New England have descended. Elizabeth died in 1678 at the age of 44. The Greenleafs had ten children. Hon. James Coffin was born in England in 1639. He married Mary Severance, daughter of John and Abigail Severance of Salisbury, Massachusetts, in 1663. James was the first settler to settle on Nantucket after the purchase. He later became a leading figure in Nantucket politics. He served many terms as Chief magistrate on the Island. James and Mary had fourteen children with twelve surviving into adulthood. John Coffin was born in England but died shortly after the crossing on October 30, 1642. Mary Coffin was born in Haverhill, Massachusetts, in 1645 and married Nathaniel Starbuck at the age of 17. Mary was a most extraordinary woman. Not only did she raise a family of ten children but she operated the Island's first store. Her open mindedness gained her respect from everyone who knew her. Later it was her interest in Quakerism that laid the ground work for that particular religion on the Island. Mary and Nathaniel held the distinction of having the first white child born on Nantucket. Mary died on November 13, 1717. Lieut. John Coffin was born in Massachusetts, on October 30, 1647, exactly five years to the day of the death of his brother John. John married Deborah Austin daughter of Joseph and Sarah Austin. Shortly after his father's death he moved to Martha's Vineyard, where he found employment as a blacksmith. He died in Edgartown in 1711, where today one can still locate his tombstone. Stephen Coffin was the last child born to Tristram and Dionis Coffyn. He was born in Newbury, Massachusetts, in 1652. He married Mary Bunker in 1668 and had ten children with Mary. Stephen took over his father's estate on Nantucket where he lived out his life as a farm manager. He died on November 14, 1734. James Coffin was born August 12, 1639, in Brixton, Devonshire, England. He was the fourth child of Tristram and Dionis Stevens Coffin. James was only three years old when his father immigrated to America. The family first settled in Salisbury before heading down the Merrimac River to Haverhill where after only a short time they relocated once more to the town of Newbury. James' family operated a ferry on the south side of the Merrimac River. They also operated a Tavern/Inn which was located near the landing. During the 1650's with the older brothers and sisters going off in their own directions, James took over their responsibilities. Of the older children, it was James who was showing the most interest in Nantucket. James' brothers had already established enterprises on the mainland and wanted to remain there, however, they were willing to invest in the plan financially. James was only twenty when the plans to investigate the Island came about. Depending on whose account of history one would study, James did go with his father on the voyage that took them to Nantucket for the first time. After negotiations with the Indians and Thomas Mayhew, the Island became the property of the Salisbury group, with ten full share members and ten partners. Thomas Macy, James Coffin, Edward Starbuck and Isaac Coleman proceeded quickly to inhabit the Island before the next winter. Edward Starbuck was a former resident of Dover N.H.. His daughter Abigail married Tristram Coffyn's son Peter. Starbuck had lived in Dover since 1643. In the 1640's he refused to join the church in the ordinance of baptism so he and the church parted company. In 1648 he was charged for disturbing the peace of the church. He apparently disapproved of the submersion of babies during baptism. Others had been tied to ox carts and whipped for similar crimes, however, Starbuck got off with a lighter sentence but never again respected the Puritan rule. In the book Nantucket by W.O. Stevens, he states that the first white inhabitants on the Island spent their first winter on the western side of the Island near the area now known as Madaket. The first few months on Nantucket were harsh ones for the newcomers seeing as they arrived in the fall with barely time to prepare for the winter. Had the Indians not been so accommodating the new settlers would have found it hard to survive the winter. Salisbury to organize the move while his son James stayed on, and with the help of two Indians, he built their first house overlooking Capaum Pond. During the following years, 1661 to 1664 the flurry of traffic between the mainland and the Island increased as provisions and building materials made their way to their new found home. James on numerous occasions travelled back and forth from Nantucket to Salisbury as well as Nantucket to Dover. Back in Nantucket, the Indians were aware of the war being waged on the mainland but despite pressure from other tribes, they decided to stay neutral. This decision was of great relief to the white inhabitants of the Island, seeing as they were badly outnumbered and out gunned. Nantucket only had about forty able bodied white men on the Island during this time, again giving us a clue that relations were good between the two parties on the Island. James' house lot at Capaum Harbour placed him due south and only a few hundred yards from his father's house. To the south lay the lot of Nathaniel Starbuck, who was married to James' younger sister Mary and also the building known as Parliament House. This house was where most of the communities' decisions were made, however, the Starbucks house and general store provided the meeting place for gossip and news. It was also this time in the mid 1670's that the Island's first signs of settler unrest was unfolding with the Coffin group in disagreement with the Gardner group. The main cause of conflict was that the half share holders only received one vote while the full share holders received two votes, therefore, the late comers to the settlement were continually losing out on their attempts to change the Island. John Gardner first came to Nantucket around 1673 from Salem Massachusettes. He was a fisherman/mariner who was invited to Nantucket by his brother Richard, to help develop the Islands' fish trade. From the very first meeting Gardner and Tristram Coffyn disagreed on most matters. Both being determined and proud men, they would not easily be swayed. Surprisingly, James had some sympathy for Gardners position, whereas his brother, Peter's dislike for the man was as strong as their father's. In the latter part of the 1670's it was often James and his sister Mary who would attempt to smooth over the bad feelings between the two groups. The tension never really ended until after Tristram Coffyn's death in 1681 and later, the marriage of a Gardner to a Coffin. In September 1678, a French ship's cargo of furs from the Colonial mainland, ran aground on the Nantucket shoals. James Coffin among others made matters worse by innocently asking permission from his father, who at the time was the Chief Magistrate of Nantucket, to remove the cargo of two thousand furs from the shipwreck. Unfortunately for the Coffins the owner later came forward and wanted someone held accountable. The burden of responsibility fell on Tristram Coffyn's shoulders. He was the Chief Magistrate of the Island and it was his responsibility by law to launch a salvage of any wrecks that ran aground on the Island, and securing the contents until they could be claimed. Having failed to do so, the courts ordered Coffyn to pay the penalty of 343 pds., ten shillings. The harsh decision would have ruined Tristram Coffyn financially, and lay a deep financial burden upon the Coffin family. Tuckernuck Island off the west coast. Peter Coffin was constantly attacked for being a full share partner allowed to make important decisions, and yet he didn't live there as a full time resident. The bad blood between the Coffins and the Gardners was now really only between Peter Coffin and John Gardner, so it must have been a topic of amusement for the Islanders when it was learned that Peter's son Jethro had fallen in love with Gardner's daughter Mary. To make matters worse for the two fathers, the two later decided to wed and reside in Nantucket. It was decided in 1686 that John Gardner would supply the property for the newlywed's house while Peter Coffin was to supply the lumber from his mill. During the wedding ceremony Peter Coffin realized that the appropriate deed for the property had not been transferred to his son Jethro and so he stood up just prior to the wedding vows and exclaimed in a threatening tone that the wedding be put to a halt right then and there until the appropriate paper work was signed by all parties. John Gardner assured Coffin that it would be taken care of as soon as possible but Coffin persisted until finally Gardner grudgingly had to get the papers in question and sign them and only then did the wedding continue, much to the embarrassment of the bride and groom. Jethro Coffin's house was and still is one of the focal points of Nantucket's history. Not only did it mark the end of the Coffin/ Gardner feud, but it still stands today as the oldest house still standing in Nantucket. Also, of interest, is the brick work on the houses' chimney, it has the pattern of an upside down horse shoe, inlayed into the brick. In the 1600s the settlers believed this would ward off witches and evil spirits from entering the home. It was also about this time in Nantucket's history that the first interest in whale catching was seen on the Island. Apparently one incident in the 1670's captured the imagination of some of the Island's more adventurous souls. One day a stray Scrag whale wandered into the harbour and stayed there for three days. During this time the Islanders took it upon themselves to devise ways to capture and kill the whale which led to constructing the Island's first harpoon. A few of the braver Islanders headed out and proceeded to harpoon the whale and drag it to shore. Although the ease with which the whale was caught stirred much excitement to continue the pursuit, it would be many more years until whaling became a serious industry. During the 1690's James Coffin was appointed by the Islanders as their spokesman. He was elected by the town of Nantucket to be the first representative to the Great and General Court under the Royal Charter granted by William and Mary in 1691. He was also the representative sent to negotiate the terms in which Nantucket would fall under the jurisdiction of Massachusettes instead of New York. Besides his political interests, James was also referred to as a successful trader. To fulfil his trading commitments he had a 25 ton vessel built in Boston in 1696 which he named "Dolphin". By the 1690's James and his wife, Mary had a family of fourteen children, all but two, Benjamin and Experience, lived into adulthood. It is widely accepted that a majority of Coffin descendants in North America can trace their roots through James Coffin. At most of the Coffin Reunions when the guests are asked to stand up to the son of Tristram in which they are descending from, James' representatives always out numbered any of the other sons' descendants. In the early 1690's John Gardner became the first Deputy of Nantucket to sit in the General Court of Massachusettes. After his term the position was held for the next two decades with only a few exceptions by James Coffin. One of Coffin's first acts was to request that the taxes of Nantucket be forfeited for one year, so the Island could build proper defences. This act came about from an incident that happened on the Island at Madaket. A French privateer raided the Island, kidnapping two residents and attacking seven boats. James was also Judge of Probate from 1706 to 1718 retiring at the age of 78. A large majority of the courts work load dealt with Indian matters. Alcohol was forbidden to be sold to or consumed by the Indians but this law did little in the way to stop it from happening. Other issues dealt with petty theft and even the occasional murder. Penalties ranged from fines and lashings for the minor crimes to imprisonment and execution for the more serious matters. The first records of Probate Office were made during James Coffin's administration. Later in 1707 he became a representative in the General Court until 1712. On July 28, 1720 James Coffin died in Nantucket at the age of 80. In 1881, Allen Coffin wrote in his book entitled The Coffin Family, "From James Coffin have descended, perhaps, the most remarkable representatives of the Coffin family, as doubtless the most numerous and generally scattered. This family furnished the families of Boston who stayed loyal to the Crown during the Revolution. General John Coffin and Admiral Sir Isaac Coffin as well as the most distinguished woman which America produced, Lucretia Mott, all descend from James Coffin." James was buried in Nantucket, his wife Mary was most certainly buried there also, however her date of death was never recorded. Mary Coffin was born in 1665 and married Richard Pinkham of Portsmouth and her second marriage was to James Gardner, son of Richard and Sarah. James Coffin was born in Nantucket on July 9, 1664. He married Love Gardner, daughter of Richard and Sarah. In 1692 he married Ruth Gardner, daughter of John and Priscilla. Nathaniel Coffin was born in Dover, New Hampshire in 1671. He married Demaris Gayer, daughter of William. Nathaniel was a sea captain and great grandfather to Gen. John Coffin and Admiral Sir Isaac Coffin. Nathaniel died in 1720. John Coffin was born in Nantucket and married Hope Gardner, daughter of Richard and Sarah. He died in 1747. Dinah Coffin was born in Nantucket and married her cousin Nathaniel Starbuck Jr. in 1690. She died in 1750. Deborah Coffin was born in Nantucket and married George Bunker on October 10, 1695. She died in 1767. Ebenezer Coffin was born March 30, 1678 in Nantucket. He married Eleanor Barnard on December 12, 1700. He died in 1730. Joseph Coffin was born in Nantucket on February 4, 1679. Joseph married Bethiah Macy. Joseph died in 1719. Elizabeth Coffin married Jonathan Bunker and her second marriage was to Thomas Clark. She died in Nantucket on March 30, 1769. Benjamin Coffin was born in 1683. He was washed overboard and drowned between Nantucket and Martha's Vineyard when he was young. Ruth Coffin was born in Nantucket and married Jospeh Gardner, son of Richard and Mary. She died in Nantucket in 1748. Abigail Coffin was born in Nantucket and married Nathaniel Gardner, son of Richard and Sarah. She died March 15, 1713 in Nantucket. Her burial was the first in Gardners burial ground. Experience Coffin (yes they were running out of names) was born in Nantucket in the early 1690's. She died in infancy. Jonathan Coffin was born in Nantucket on August 8, 1692. He married Hepzibah Harker in 1711. Jonathan died in 1773. James Coffin was born July 9, 1664, on Nantucket Island. He was the first child of the Hon. James Coffin and Mary Severance. The birth date of James is surrounded by controversy. Most records show his birth to be between 1667 and 1671, while his parents were living in Dover, New Hampshire. However, the Nantucket VR (P.R. 38) shows his birth as 09/05/1664. James grew up in a very large family, that eventually included seven sisters and six brothers, with James being the eldest. Being of the second generation of settlers to the newly established colony, James was exposed to the hardships of developing the first farms on Nantucket. The sandy soil supported little in the way of crops. They brought sheep to the Island, in hopes of exporting the wool to the mainland in exchange for provisions needed to support their colony. Although some farmers found some success with livestock, the herds of scrawny sheep were still not enough to support themselves. During these first few years, about 1665, James' father decided to move the family off the Island, to Dover, New Hampshire where he had land holdings from earlier years, however, with the Indian uprisings during King Philip's War, in the 1670's, the Coffin's moved back on to Nantucket to stay. They returned during the years of development in the fishing industry. John Gardner had been commissioned to develop the fish trade, while the rest were trying their best to develop productive farms. Both Peter Folger and Tristram Coffyn, James' grandfather, were said to have had productive grist mills which indicates that there was some evidence of success with farming, however if the colony was to develop, more would have to be done. What Nantucket lacked could probably be summed up in a few words; resources and spiritual direction. The initial goodwill was running thin. It was a time of squabbling between settlers. The full share holders were quarrelling with the half share holders. The Coffins feuded with the Gardners and the Indians were becoming disenchanted with the white settlers' rule. Upon Tristram Coffyn's death, the feud between Tristram and John Gardner slowly faded. Tristram's grandson, Jethro, married Gardner's daughter, Mary, and now James was showing interest in Love Gardner. The Coffin House, Newbury, Mass. The Jethro Coffin House, Nantucket, Mass. Gardner, daughter of John Gardner. On May 19, 1692, James and Ruth were married. At about the time that James and Ruth were married, a group of Nantucket settlers atop of Folly House Hill were observing whales spouting a short distance off shore. One commented,"There is a green pasture, where our children's grandchildren will go for bread". This isn't the first time that the Islanders had taken notice of the abundance of whales off their shores, nor was it even the begining of the New England whale trade, for whales had been captured for over fifty years upon the coast of Long Island and Cape Cod. In the 1670's a whale was captured for the first time in Nantucket, and later on the Islanders took it upon themselves to hire a whaler named James Loper from Cape Cod, to come to the Island to teach the ways of whaling. Up to that time whaling on Nantucket consisted of waiting until a dead whale carcass washed up on shore. All the Islanders would rush for their claim including the Indians. Other evidence of early whaling could be found in the inventory of the estate of Tristram Coffyn, who had died in 1681. It showed 45 lbs. of whale bone, valued at 10d. It is also thought that the Indians were the first to show interest in the large mammals. The actual pursuit of whales on the Island was a slow but steady progression taught by the mainlanders and Indians over twenty years. They showed the settlers the ways in which a whale was to be approached to prevent the animal from getting frightened. Men such as Loper, showed how to extract the oil from the carcass, and where to thrust the harpoon. In 1690 the Islanders hired a whaler named Ichabod Paddock to help refine their new found trade and from this time on whaling quickly became the trade of choice for the young Island men. It was no accident that the settlers took to whaling with such ease. The Colony could not survive without a profitable resource. Farming the sandy soil was not very productive, and their livestock were poor in quality. On the other hand their offshore location placed them close to migrating whales and their harbour at Shelburne offered good protection for their boats from bad weather. In the beginning of shore whaling the Islanders divided the south shore of the Island into four equal parts, each consisting of three miles of shoreline. Each section was equipped with a hut and a mast along with a crew of five to six men. From the mast the signaller would spot the spray from a spouting whale and the chase would begin. The men would rush to the beach and launch their boats into the surf rowing with all their might. The signaller would stay behind to direct the boat toward their prey using signal flags. As the boat approached the whale the harpooner would drop his oars and ready himself for the kill. Once upon the whale the harpooner would thrust his harpoon into the animal for the capture, meanwhile the rowers would feverishly back paddle to escape any thrashing of the huge tail. Once the kill was completed they had the task of rowing the dead whale back to shore and land it on the beach. The whole hunt start to finish could take hours and needless to say the crew was exhausted by the end of the hunt. Once successfully on shore they would start cutting the whale blubber into cubes and then used a process called "trying out". This consisted of erecting large tripod kettle holders on the beach. They would set fires under the large kettles and boil the chunks of blubber down until the oil separated from the fibres. Then using large ladles they would scoop the oil into barrels and prepare it for shipment. Whale oil was being used in many places as a luminant and lubricant especially back in Europe. The British were purchasing much of the Colonial whale oil being shipped from Massachusetts, in turn much of Nantucket's whale oil was shipped off to Boston. James and Ruth's first child, George, was born in 1693. In 1695 Sarah was born, followed by Nathan in 1696 and Elisha in 1699. During these years James was farming and taking care of livestock. The town meetings of March 19, 1707 recorded that "James Jr. was appointed to take account of all fleeces at ye time of sheering". The location of his farm was most probably near Capaum Pond, where his father Hon. James Coffin had property. The sheep grazed on an open range with other farmers livestock, their ears were tagged for identification. During the sheering, the atmosphere was festive and celebrated by most of the Islanders. With regards to the ocean trades the Coffin, Gardner, Starbuck, Hussey, Macy and Paddock families were in the forefront of Nantucket's beginnings with fishing and whaling, James' brothers, Nathaniel, Jonathan and Ebenezer were active in the trade during the 1690's and into the 1700's. James is not on record as being involved as a mariner, but it is hard to believe that he was not, at least for part of the season, after all he was married to Captain John Gardner's daughter Ruth, whose family were all fishermen. With the whale industry on the rise the town was gradually being shifted from Capaum Harbour to Shelburne. The whale stations along the south coastline were now giving way to whaling sloops anchored in Nantucket harbour. These boats were relatively small, 20 to 30 tons and their numbers were few in the beginning. They would apply their trade just off the Nantucket coast. whipped and others were hung. 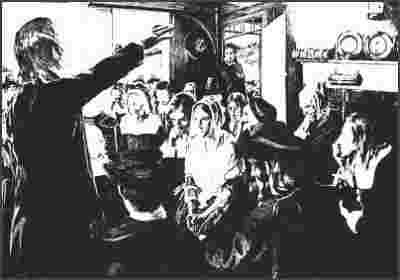 The harsh Puritan rule of the Colonies made laws against those who helped the Quakers in any way. These same laws were what the Islanders were fleeing from when they first came to Nantucket fifty years earlier. Some had even helped the Quakers, so it isn't hard to understand why the seeds of the Quaker faith took root in the soil of Nantucket. Most of the Islanders were already Christians of different faiths, mainly Baptists, but the Quaker belief in hard work and plain lifestyle seemed to be more suited to the settlers way of life on Nantucket. As mentioned earlier, what the Islanders lacked was resources and direction, now with the ever increasing whale industry turning profitable, along with their Quaker beliefs in hard work, the Island was beginning to pull away from the mainland's whale trade, in terms of productivity. It was recorded by many visitors that Nantucket was very different from the mainland regarding its flurry of activity and plain dress of its people. It was called a marriage of religion and commerce. In the early 1700's the writer, Hector St. John de Crevecoeur, described how Islanders, the majority being Quakers, methodically trained their young in all aspects of the whale business. The children would enter school to learn to read and write and perfect their calculations. Then at age twelve, they would apprentice in trades such as barrel making and at fourteen they would go off to sea. While working on the sloops, they would be taught the art of navigation, along with the steps involved in whaling start to finish. Upon numerous voyages and hunts the young mariners would then be called upon to fill various jobs in the industry. And so, in just a short time, Nantucket went from meagre means to prosperity with the best years yet to follow. During these years in the early 1700's, James' father Hon. James Coffin was the Chief Magistrate on the Island. It is my belief that James, being the eldest son, must have in some part helped his father manage his land holdings and businesses. It's known that James Sr. had trading sloops going back and forth from the mainland. These sloops would have needed crews of up to ten men, depending on the size. Wool and whale oil would most likely have been the exports. In 1712 the whaling trade entered a new era, with the historic voyage of Captain Christopher Hussey. Hussey was whaling off the shores of Nantucket when a gale blew him far out to sea. Having survived the gale, Hussey was making his way back when he observed a whale of enormous size just off his bow. With a good measure of courage, he attacked the whale and managed to be successful in killing the animal. The whale was not of the "scragg" or "right" species, but was a sperm whale. They found the oil to be of a much better quality, burning cleaner and brighter and so began not only the pursuit of sperm whales by Nantucket whalemen, but also sea ventures further off shore than ever before. By 1715, Nantucket had six sloops engaged in the whale trade. Two of these vessels were owned by Coffins, the Nonsuch, 25 tons owned by James' brother Ebenezer and the Speedwell, 25 tons owned by James' son George. Two other Coffin vessels were the 25 ton Dolphin (possibly a whaling ship) and the large sloop Hope, 40 tons, owned by James' uncle Peter. The Hope was a trading vessel. By the 1720's James' sons George, Nathan, Elisha and Joshua were all part of the whale trade along with his brothers Ebenezer and Jonathan. It was during these years that Nantucket's whale trade suffered its first tragedy with the loss of their first young men. On April 27, 1722, James and Ruth suffered the loss of their sons Elisha and Joshua. Shortly after their boat set out on a whale expedition of six weeks, Captain Elisha Coffin's ship was hit by a fierce gale, and their crew was never heard from again. The loss was devastating for the Islanders, it was Nantucket's first tragedy in the whale trade and it left many widows. Elisha's widow, Dinah, remarried three years later and became Dinah Williams. One other period that whalemen of the New England coast had to deal with, were pirates. Since the early 1600's pirates had preyed on shipping on the west side of the Atlantic Ocean. Most pirates were unemployed seamen and ex-navy sailors, who between wars found themselves with little to do with their time. During wars, countries would hire them to attack the enemy, but most times they would wreak havoc on any easy target. Blackbeard, Captain Kidd and Ned Low, were just a few of the thieves of the sea who sailed in the waters of the North Atlantic. Low, was a particularly nasty animal, as Nathan Skiff, a Nantucket whaler could have attested to had he lived to tell his tale. In June of 1723, Skiff was in pursuit of whales about eighty miles off Nantucket, when Ned Low's ship spotted Skiff's sloop. Low, who was described by his own crew as a maniac and brute, immediately chased down the whaling ship. Luckily for some of the whaling crew they were out in their small whale boats when the attack occurred and managed to escape to a distant ship. Captain Skiff was not so fortunate. Low ordered Skiff stripped and proceeded to whip the young Captain around the deck of the boat with a belt. Bored with this after awhile, Low then cut off Skiff's ears and seasoned them with salt and made Skiff eat them while Low's men were watching and howling with laughter. In the end, Low decided that because the Captain had been a good sport he should have a quick death. Skiff was shot in the head and his boat was sunk. The remaining crew were set adrift in a small boat with no water or food and left to perish. Little did Ned Low realize that the Nantucket boys were taught the art of navigation and shortly after the Pirate ship was out of sight and they simple returned to the Island. A few months later Low's men turned on him and set him adrift. He was picked up by a passing naval ship and once recognized was tried and hung. James and Ruth had eleven children in all. Their last born was Benjamin born in 1718, Ruth was in her mid forties and James would have been in his late fifties. Whether James embraced the Quaker faith is a question requiring more research, however, most of his children seem to have had connections to it. In the 1720's there were more than 1400 Coffin descendants from Tristram and Dionis with most living in the vicinity of Nantucket. Therefore, the records of who was who becomes somewhat confusing. Their given names give some clue as to their faith. Names such as Elisha, Rebeka, Seth and Uriah, are most certainly biblical names and most probably Quaker names, but it is hard to say what faith they were for sure. The 1720's and 1730's saw Nantucket prosper with every year. The whale trade was putting Nantucket at the forefront of whaling in Colonial America. By 1730, Nantucket had a fleet of 25 whaling boats varying in size from 30 to 50 tons. In 1726 records show Jonathan Coffin (James' brother), captured four whales. James' son George captured one and Bartlett captured four. In all 86 whales were captured by Nantucket boats. Soon Nantucket could no longer supply the men needed to crew the boats and they recruited whalers from New York and Cape Cod. The prosperity continued on during the last years of James' life. James Coffin died August 2, 1741 on the Island. His wife Ruth died in Nantucket in 1748. His will was probated on November 6, 1741. Benoni Coffin was the only child born to James and his first wife Love. Records show he died young. George Coffin was born in 1693. He was the first child born to James and Ruth. George was a whaler upon his own vessel. He married Ruth Swain in 1717. He died in 1727 at the age of 34. Sarah Coffin was born in 1695, she married John Gardner's son Jeremiah in 1711 at the age of 16. She died December 1, 1739. Nathan Coffin was born in 1696. He married Lydia Bunker, daughter of John and Elizabeth. Nathan was a sea captain. He died December 11, 1768. Elisha Coffin was born 1699. He married Dinah Bunker daughter of Peleg and Susanna. Elisha was a sea captain and a whaler. He was the first Nantucket whaleman to be lost at sea. He died on or about April 27/28, 1722. Joshua Coffin was born in 1701. He married Pricilla Bunker daughter of Peleg and Susanna. He was lost at sea with his brother Elisha in 1722. Elizabeth Coffin was born in 1703. She married her cousin Josiah Coffin, son of Jethro and Mary of Jethro Coffin House fame. She died in 1774. Pricilla Coffin was born March 3, 1708. She married Abel Gardner, son of Nathaniel and Abigail. She died April 27, 1792. Mary Coffin was born May 29, 1710. She married John Bunker son of George and Deborah in 1725. She died on July 19, 1775. James Coffin was born April 10, 1713. He married Pricilla Rawson, daughter of Wilson and Margaret. He died April 11, 1784. Ruth Coffin was born on January 17, 1716. She married her cousin Cromwell Coffin, son of Ebenezer and Eleanor. She died September 30, 1801.
from the collection of the Nantucket Historical Assn. "There is something extremely painful in the destruction of a whale...yet the object of the adventure, the value of the prize, the joy of the capture, cannot be sacrificed to feelings of compassion". Benjamin Coffin was born on Nantucket Island on November 16, 1718. He was the youngest child of James and Ruth (Gardner) Coffin. Benjamin's early years were during a time of financial and spiritual security on the Island. After years of struggle, the small community had found success with the whale trade along with spiritual direction being given by the Quakers. Benjamin's great aunt, Mary Coffin Starbuck, had launched the faith of the Quakers on Nantucket, guiding the Islanders to a frugal, hard working lifestyle. Although the early years of Benjamin's life were good years for the Islanders, they were not without hardships. When he was only four, his family suffered the Island's first loss of life involving the whale trade, with the drowning of Benjamin's older brothers, Elisha and Joshua during a violent storm. Benjamin himself was named in honour of another drowning victim, his father's baby brother, who was washed overboard many years earlier, during a crossing from Martha's Vineyard to Nantucket. The Nantucket boys learned early through these losses that the ocean demanded respect and through this respect came the foundation that eventually made the crews from the Island some of the bravest and skilled sailors in the world. Benjamin would have grown up surrounded by the whale trade. His brothers George, Nathan, Elisha and Joshua were all part of it, as well as many uncles and cousins, too numerous to name. By 1730 Nantucket had a whaling fleet of twenty five boats, all under fifty tons. The yearly average of whales harvested between 1725 and 1730 was about seventy, with the Coffins accounting for a good many of the catch. Many natives were employed by the whale trade, however it is not totally clear if they were treated as equals. Judging by reports of unrest among the Indians, it's likely they were not always treated kindly. One report in 1738 tells of fears amongst the whites to leave Nantucket on whaling expeditions due to rumours of the natives who were left behind plotting to kill the settlers and setting fires to their homes. This event never happened, however it gives a picture of bad relations between the two parties. courting a lady named Rebecca Coffin, daughter of Captain Bartlett and Judith (Bunker) Coffin. Rebecca's father, Bartlett, was a descendant of Hon. James Coffin's brother, Lt. John Coffin. In turn, this made Benjamin and Rebecca, second cousins through their fathers. Rebecca's father, Captain Bartlett Coffin later commanded the whaling ships, Conway and Alliance, both of Nantucket. If by this time there were any thoughts that the Coffin blood was thinning in this line, due to outside the family marriages, they were put to rest, when on March 22, 1739, Benjamin and Rebecca were married. Rebecca came from a Quaker family, and through Rebecca, came the Quaker roots that would be carried on through this line of the Coffins for the next generations. Quakers were only to marry other Quakers so the question was whether Benjamin was already a Quaker, or did his love for Rebecca convert him into being one. It is also worth mentioning at this point that Rebecca had two brothers, Uriah and Peleg, who would in later years come with our Coffins to Nova Scotia. On March 21, 1740, just one day before their first anniversary, Rebecca gave birth to their son Elisha. The name Elisha derives from the old testament prophet Elisha (850B.C. - 795B.C. ), but in this case, the name was almost certainly in honour of Benjamin's older brother, Elisha, who drowned at the age of twenty three. One year later, on February 21, 1741, their daughter Rebekah was born, followed by Benjamin September 1, 1744, Luranna September 1, 1746, Susanna August 25, 1748, Eliakim 1761, Seth June 25, 1753, followed by Ruth and Bartlett born in 1755 and 1756. Benjamin worked in the whale trade but on which ship? It is probable that he worked for his father-in-law Captain Bartlett Coffin aboard one of his boats, or possibly he worked with his brothers on one of their numerous boats. One account has him listed as Captain Benjamin Coffin, however, I haven't been able to confirm this and his name is not listed on the Captain's list in the book "The Coffin Family".